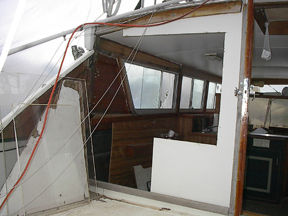 Water damage rotted the back cabin wall on both sides. 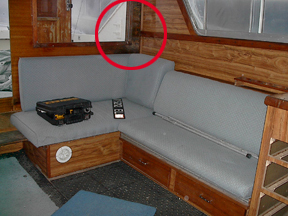 Here you can see the dark/black areas of rotten wood, circled in red. 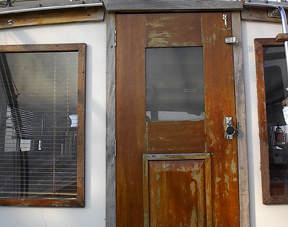 Rotten wood was removed, a template was created, and the wood was replaced. 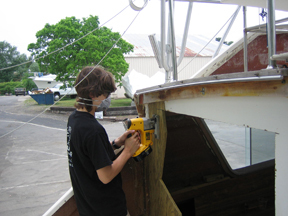 Half of the cabin wall was replaced on either side of the boat. 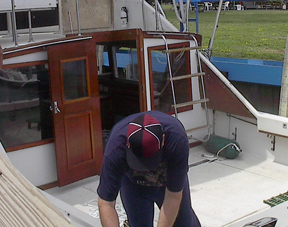 The photo below shows the cabin on the starboard side after removal of rotted wood. New wood replaced old wood, and final cuts were made. Back wall and door before refinishing.